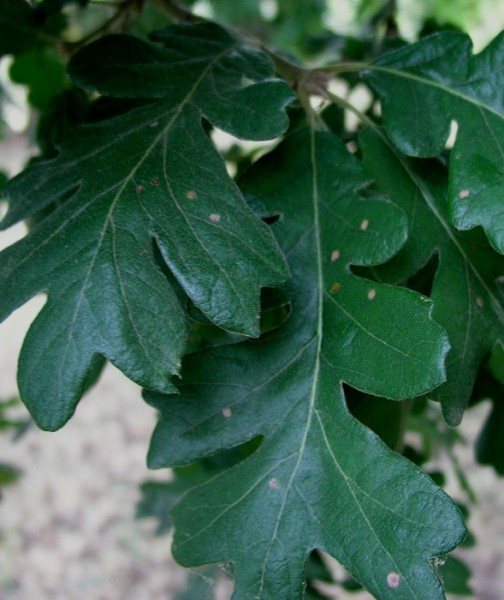 Habit: this heavy limbed oak can grow to great heights reaching 75 ft (25 m) or more. The crown is broad spreading, open and rounded. The mature bark is light gray, thick, and furrowed in a checker-like pattern. The upper surface of the leaf is shiny and dark green but the underneath side is paler and hairy. They are simple (not divided) with 6-11 rounded deep lobes that are up to 5 in (12 cm). Flowering takes place from March to May and are small drooping male catkins or female pistillate (lacks stamens) flowers are either singular or in small clusters. Fruit is an oblong acorn 1-1.5 in (2-3 cm) long that mature in one year between August and November. The leaves turn yellow brown in the fall. Ecology: found in the Northwest to Southern California, from 980-5900 ft (300-1800 m) in montane coniferous forests, woodland slopes, dry prairies and dry rocky areas. 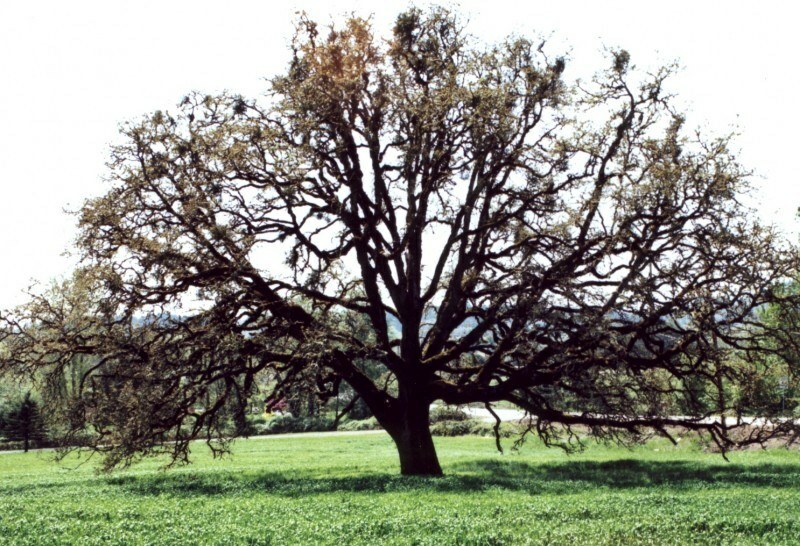 Oregon oak takes the form of a shrub on nutrient-poor soils and drier sites. Growing Conditions: full sun to partial shade and a variety of soils ranging from dry to very moist and poor to rapidly draining. Mature Oregon white oaks are not considered shade tolerant. Likes dry soil in the summer. Oregon oak is a valuable source of food, habitat and cover for many different types of wildlife. The acorns are edible, but need to be leached of the tannins first.